Whether it’s the moment you first step into Rapture, kill your first Big Daddy, or that twist near the end, you’re bound to have come away from BioShock with a treasured memory. 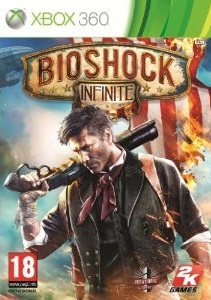 Despite a less than enthralling sequel, BioShock Infinite has been met with plenty of anticipation. Trading an underwater city for one which lives in the skies, swapping isolation for an almost-constant companion and even rebranding many of the trademark mechanics of the series, you’d be fooled into thinking that Infinite has come on leaps and bounds from its predecessors. And while you may be wrong, don’t let that put you off too much: Infinite is a landmark achievement in storytelling and characterisation and the gunplay is potent enough to keep you going despite its familiarity. You are Booker DeWitt. Drowning in debt, he is offered a chance at redemption. In exchange for a clean slate, he must extract a girl called Elizabeth, who has been imprisoned since childhood. What Booker doesn’t realise is that there is far more to this job than meets the eye, as he is thrust into the sky and the floating city of Columbia. The story runs deep, with lots of little touches and subtle moments which you may miss altogether. It’s a lot to digest, especially when you reach the mid-point, but Irrational have managed to weave an intriguing and in-depth tale. There is the similar outline of man holding too much power, but it’s executed in a completely different manner to previous BioShock games. Themes such as religion, capitalism and Marxist uprisings are all explored. The ending is also great: a one-two punch of twists and build-up that will leave you thinking long after the end, even if it leaves you with more questions than answers. 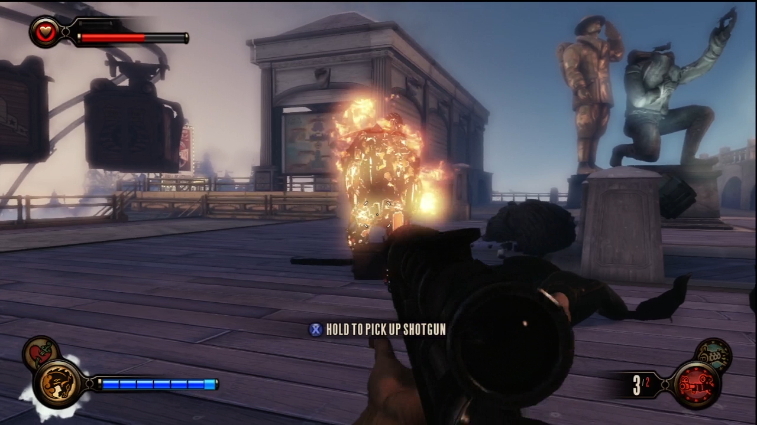 BioShock Infinite certainly gives a good first impression. The opening moments as you step into Columbia are gorgeous: the blue-skied, sun-kissed city is bustling with detail, such as children handing out newspapers and people gossiping on benches nearby. Two gameplay benefits come from the city too: obviously being an air-city, goons can be thrown off, which allow you to deal quickly with some of the tougher foes in the game. The other main feature is the Skyline system. Once you gain a grappling hook, you’re able to ride these skylines. It’s not only is a fun and speedy way to travel, but also opens up options in the battlefield, such as reaching vantage points or attacking goons on the ground using a special strike move. Though the linear design means you can’t backtrack, you’ll certainly feel like exploring areas as you pass through them, and the city of Columbia is a remarkable combination of beauty and expanse. That being said, you’ll quickly realise that despite a different city, Infinite is still very much a BioShock. 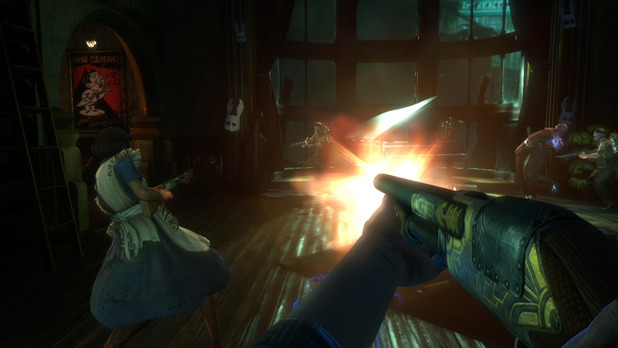 Vigors – essentially a rebranded version of Plasmids in previous game – allow Booker to cast fire, throw enemies and levitate them and even send a group of murderous crows after opponents. Vigors can be used in tandem with both guns and other powers, which can create satisfying combos. You can also pick up Gear which adds constant benefits such as full-health after dying. The vigors present are cool to use, and powerful weapons combine to make gunplay pretty darn fun, even if it’s not wholly different to previous games. A couple of issues rear their head though. The default control scheme feels unwieldy and confusing, though an improved Marksman scheme is thankfully available. The game is also more linear, removing much of the backtracking from previous games. While the action tighter as a result, other parts like making decisions which have no bearing on future events feel pretty pointless. Looking past the gameplay, Irrational have another remarkable achievement on their hands: Elizabeth. A central part of the game once you meet her, she is admirable in the way the developers have constructed her. Bearing lifelike facial expressions and engaging dialogue, she makes the journey much more fascinating. You begin to learn the intricacies of her, the city of Columbia itself and its controlling overlord through dialog between Booker and Elizabeth while she begins to interact with a world she has mostly been isolated from her whole life. She also brings gameplay benefits; she can pick locks to open the path or give you access to hidden items, toss you ammo or health and salt packs throughout combat – though not to a degree that it becomes irritating or nulls any challenge – and open Tears, which can bring turrets, weapons and items into the world. Her A.I. is excellent, never becoming a nuisance in combat or causing headaches from a lack of response. It’s fair to say the journey would be duller without the company of Elizabeth. 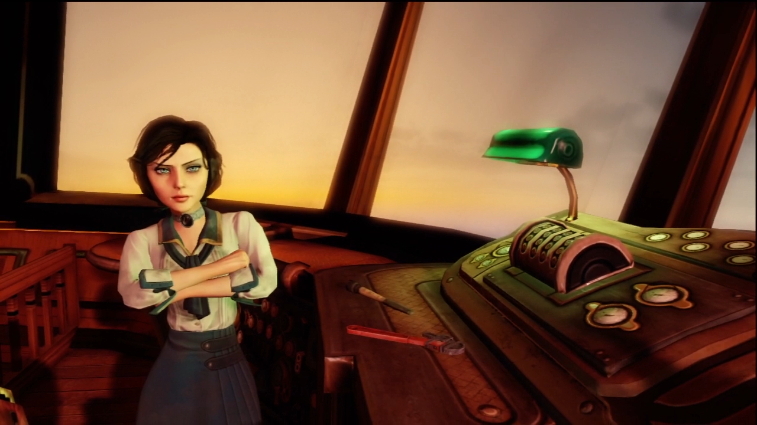 BioShock Infinite also benefits from an excellent art direction. There’s a kind of atmosphere created through the old architecture and music, immersing you into the early 1900s. The beautiful lighting, great animations and visually shocking vigor transformations are all highlights among the package. Unfortunately some rough spots come in the form of occasionally flat and pixelated texturing as well as frame rate woes, whether it’s due to poor console optimisation or the dated engine. That being said, there’s a lot of visual splendour, and the blemishes aren’t enough to detract. Audio is just sublime, as top-notch voice acting and intensely engaging dialogue move the story forward with grace. The gun effects sound potent and the vigors are brutal to listen to, while some excellent music, including one sequence sung by Elizabeth, really stands out. Infinite is an admirable example that games do not need tacked-on multiplayer components to succeed. The campaign is remarkable lengthy, taking a good 12 hours to finish. Seconds are enticing not only due to how good the game is, but also because the ending means you’ll play the game with a completely different perspective. I’d say a second playthrough is essential. Whether from finishing the game or using a cheat code, a special 1999 Mode unlocks. You’d expect a challenge on par with System Shock 2 (the game from which the mode’s name eludes to) but actually, it’s barely a step up from Hard mode. Enemies don’t seem much tougher, and the only major challenge comes from ensuring you have enough money to prevent perma-death. It’s a little disappointing that it doesn’t present the kind of challenge the name suggests. 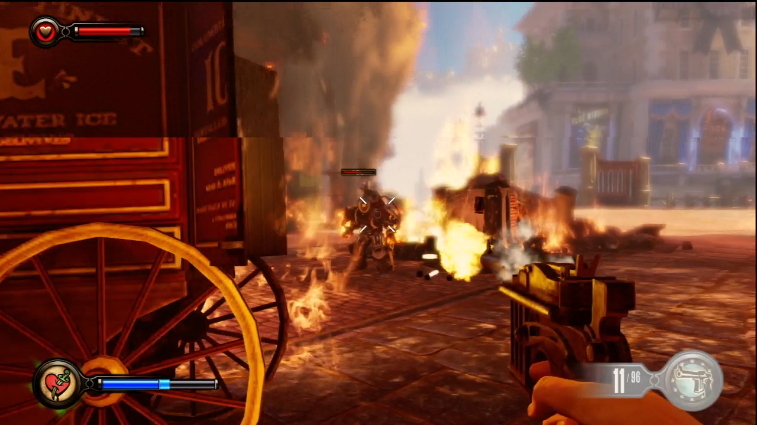 But it doesn’t sour the deal too badly, as BioShock Infinite is still a great shooter. Though it’s gameplay perhaps isn’t quite as revolutionary as some would have hoped, Infinite still takes a leap when it comes to story and characterisation, particularly with Elizabeth. It feels like you have a living, breathing companion with you as you trek through the city of Columbia. The combination of vigors and punchy gunplay makes for great fun, even if the linearity and control issues can sour some of the experience. But so long as you can look past those problems, Infinite is pretty easy to recommend. Those looking for more brains (and a fair amount of brawn) to their gunplay will find this latest BioShock is just the ticket.